The newest issue of Action Comics #987, out this week, features Superman putting himself between a gun toting white man wearing an American flag bandana and a group of helpless illegal migrants. 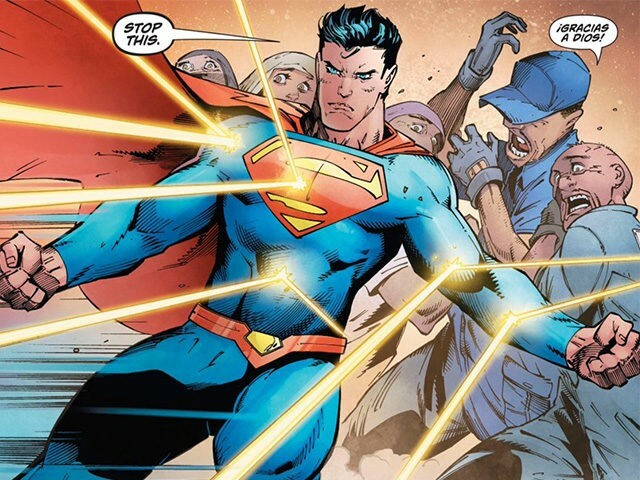 Superman blocks the bullets from the evil white man and commands him to, "Stop this!" The timing of the release is ironic, to say the least. Personal note: I'm taking a week off. We will not publish this Faith and Freedom Daily article next week. We will resume on Monday, September 25. I am also taking a week off the live daily radio program. We will be re-airing previous live programs. I will return to a live broadcast on Monday, September 25, as well. The Hollywood Reporter says in the comic book released this week, the man says, "They ruined me, they stole from me!" Superman replies, "The only person responsible for the blackness smothering your soul---is you." Breitbart News says, "In an act of super socialism, once police arrive, our Social Justice Supes order them to protect the illegals to be sure they are safe and cared for." Clearly, this comic book that has been in production for months is directed toward President Trump who has rescinded DACA and promised the American people he is going to build a wall between the US and Mexico to control illegal immigration. He has also tried to freeze refugees coming to America from terror sponsoring countries until they can be super vetted. What the writers of the comic book could not have known is that news sources are reporting this week that President Trump has changed his mind---particularly in regard to DACA. If this is true, the president's character could become confusing. The Hill reports that President Trump told lawmakers Wednesday that Republicans will move quickly to shelter hundreds of thousands of young immigrants facing an uncertain future after the president gutted a program granting legal rights to those same immigrants. The Hill is also reporting, "He also promised he would not seek to link funding for his proposed border wall to legislative action on the program." Breitbart News reported yesterday that "Trump has remained unclear on whether he will stick to his anti-amnesty campaign promises or cave to the political establishment." At this point, it appears he is about to choose amnesty. House Speaker Paul Ryan recently said he would not rule out amnesty for the 800,000 DACA recipients. Mark Krikorian, Director of the Center for Immigration Studies, warns there will be 2 impacts on America should the president choose that direction. First, there will be a surge of illegal immigration along the US-Mexico border and a surge of legal immigration as newly amnestied DACA recipients would be able to bring their relatives to the US, potentially as many as 2 to 4 million. DACA recipients currently hold about 700,000 US jobs. If they were to be replaced, that would amount to about 30,000 new jobs per month for American workers that will be lost. Should the president actually cave on his promises, he will likely loose more than new jobs. After Wednesday night's dinner meeting at the White House with Democrats Schumer and Pelosi, they released a joint statement claiming an agreement had been reached with Trump to "enshrine the protections of DACA into law quickly, and to work out a package of border security, excluding the wall..."
The backlash has been immediate and strong, particularly from the families who have lost loved ones at the hands of illegal aliens. Mary Mendoza, the mother of a slain police officer, tweeted, "Don't you dare turn your back on Angel Moms who stood by you..."
Fox News Sean Hannity, who has been an unwavering supporter of candidate Trump and President Trump tweeted Wednesday evening, "If Trump caves on amnesty---it's over." In a following tweet, Hannity continued, "If he doesn't keep his promise and goes for amnesty, it will be the political equivalence of the "read my lips, no new taxes" promise made by George H.W. Bush. After elected, he signed new taxes into law ---and was not reelected. Both Rush Limbaugh and Bill O'Reilly are saying watch Trump. He knows what he's doing. He will ultimately win and not break his promises. “…They have been in our country for many years through no fault of their own – brought in by parents at young age. Plus BIG border security”. Rush Limbaugh and Bill O'Reilly are both telling conservatives to not jump to conclusions. They both say Trump is in the process of "making a deal" and he remembers his promises. We will watch how all this plays out. One thing is certain. The comic books have their Superman, and politics has its players, but over all, there is a God in heaven who sees all and is over all. There is no attribute more comforting to His children than that of God’s sovereignty. Under the most adverse circumstances, in the most severe trials, they believe that Sovereignty has ordained their afflictions, that Sovereignty overrules them, and that Sovereignty will sanctify them. There is nothing for which the children ought more earnestly to contend than the doctrine of their Master over all creation — the Kingship of God over all the works of His own hands — the Throne of God and His right to sit upon that throne . . . It is God upon the throne that we love to preach. It is God upon the throne whom we trust. The sovereignty of God is a sweet pillow that you can lay your head upon at night. It is a beautiful truth not only that God is in control over all, but is also working everything out — the good and the bad — for your good, and his glory. Not surprising, Superman is an illegal alien himself.